I have a couple of direct mail pieces on my desk and will cite some examples of this deception. “We’ll will buy back your present vehicle for up to $5,000 over current Kelly Blue Book Value on trade towards he purchase of a Brand New Toyota or Pre-Owned model. ***” The asterisk is for the very fine print disclosure on the back of the letter which reads: On select models. Discounts and rebates will vary from model to model. Of course, with the two words “up to” in front of the $5,000, no disclosure is really necessary. Buying back your present vehicle for $1 over current Kelly Blue Book Value is technically “up to”$5,000. Chances are you never bought a new car without a Monroney Label. You may not even recognize the name “Monroney”, and think of the label that appears on all new cars as simply the “sticker or the “window sticker”. Only if you bought a car before 1958 would you not have had this federally mandated window sticker attached to your new car. Senator Mike Monroney was the driving force behind this Federal law, Chapter 28, Sections 1231-1233, and Title 15 of the United States Code. This law requires that all car manufacturers affix a manufacturer’s suggested retail price, MSRP, on every new car and truck they sell in the form of a window sticker. This MSRP is the same for all cars of the same make, model, year, and accessories. This Federally mandated window sticker can only be removed by the buyer of the car and failure to adhere to this law is punishable by up a $10,000 fine and one year in jail per offense. The reason that this law was passed in 1958 is that car dealers were resorting to deceptive advertising and sales practices to inflate the price of cars and prevent accurate price comparisons by car buyers. Car dealers were adding on extra charges, over-allowing on trade-in allowances, and offering artificial discounts. Because there was no standard price on any car, the dealer could quote any price he wanted as the retail price of the car. If a car buyer shopped at three different Ford dealers for a specific Ford model with the same accessories, he would be quoted three different retail prices. The discount he was offered was just a function of how high the dealer wanted to make the retail price. The trade in allowance could be as high as the customer wanted just by marking up the new car higher. Well you guessed it, today in 2012, fifty-four years later, car dealers are “adding on extra charges, over-allowing on trade-in allowances, and offering artificial discounts” to deceive their customers just like they did prior to 1958. The main deceptive device that the dealers invented to accomplish this was the “addendum label or sticker”. It is also referred to occasionally as a supplemental sticker. I’ve written about this before and I used the name “phony Monroney”. I call the addendum label this because most dealers design their own stickers, addendum labels, to look identical to the federal Monroney labels. They use the same colors, logos, size, and right down to the same font size and style. This is clearly an attempt to deceive the car buyer into believing that the total price is the official manufacturer’s suggested retail price. Sadly, it doesn’t have to be a very good counterfeit because many car buyers never even look at the Monroney sticker on the car they buy. Almost all car dealers add an addendum sticker next to the Monroney sticker. The addendum stickers usually list dealer added accessories that have very low cost to the dealer but very high markups to the car buyer. Common accessories are paint sealant or polish, fabric coat like Scotch Guard, stripes, Nitrogen in tires, and cheap theft deterrents like window etch. A package of these accessories will typically cost the dealer less than $100 but will carry a retail asking price of $995 to $2,995 or higher. In addition to dealer accessories there is commonly an additional markup to the MSRP carrying an innocuous, indecipherable label like ADM, MAA, or RMV. These letters stand for Additional Dealer Markup, Market Adjustment Addendum, and Regional Market Value. The amount varies from dealer to dealer and is simply a function of how much chutzpah the dealer has and how gullible he thinks his customers are. Currently there’s a dealer in South Florida, West Palm Beach Kia, that marks up every one of their new cars by $6,998 over the Monroney label, the MSRP! This comes from a virtually worthless $2,500 “appearance and protection package” and a $4498 Regional Market Value”. You might ask yourself, “Who could possibly fall for advertising a big discount when the dealer first marks the cars up $7,000 over MSRP?” You will be surprised to learn that this dealer is one of the highest volume sellers of any make in Florida. As you know, Kia is not one of the more popular selling cars, so what other than this advertising can you attribute to their success? Deceptive advertising and sales practices work and that’s why Congress passed a law fifty-four years ago to stop exactly this practice. I don’t pretend to be an attorney, but it seems to me that what dealers are now doing is flaunting a federal law. What Senator Mike Monroney envisioned and the law he introduced was to protect car buyers from exactly what West Palm Beach Kia is doing so successfully today. Senator Monroney wanted all car buyers to be able to compare a discount offered by one Kia dealer with other Kia dealers on the same year, model and equipped Kia. Adding a $7,000 markup to the MSRP so that larger discounts can be advertised and larger trade-in allowances can be offered is flaunting the intent of Chapter 28, Sections 1231-1233, and Title 15 of the United States Code. If it isn’t a direct violation, it absolutely is a circumvention of its purpose and intent. In recent surveys, car dealers have accomplished the perfect storm of fear, distrust, and vilification by the public. 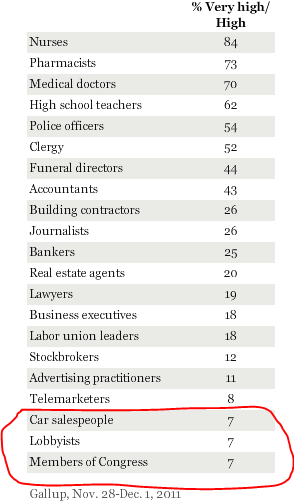 The most recent Gallup poll for the “Most and Least Respected Professions” listed car sales people tied for dead last with Congressmen and Lobbyists. In a recent poll by the American Consumer’s Federation, car sales and service received more complaints than any other business. And, lastly, in a recent survey by True Car, Florida car dealers had a higher average dealer fee ($610) than any other state in the USA. You would think that there would be some local attention paid to this by the media and the regulators. The national media reports these stories and the local media will sometimes report the national story but never do they relate it to local car dealers. National regulators like the Federal Trade Commission are highly critical of dealers unfair and deceptive trade practices. The FTC has formed an “Auto Dealer Task Force” and are holding meeting all around the USA for input from consumers and consumer advocates about ways car dealers are preying on their customers. But have you heard about any serious effort by the Florida Attorney General’s Office or any other state or local regulators to stop car dealers’ blatant deceptive and illegal advertising and sales practices? The TV and radio stations and the newspapers depend on car dealer advertising for economic survival. 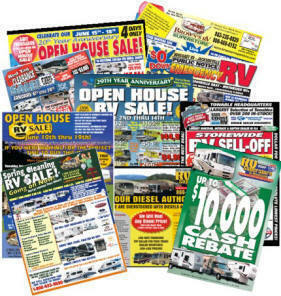 Each type of media, TV, radio, and print compete with each other for car dealers’ business. If a newspaper writes an unfavorable article about a local car dealer, he simply pulls his advertising from that newspaper and moves it to TV and/or radio. If a broadcast TV channel exposes a local car dealer, he moves his ads to another TV channel or medium. Money talks. The Attorney General is an elected office and all of the other state regulators are either elected politicians or appointed by politicians. Florida politicians fear the powerful car dealer lobbies in Tallahassee. The most powerful lobby is the Florida Automobile Dealers Association, FADA, and there are other lobbying car dealer associations in Tampa, South Florida, and Jacksonville. A long time ago I was a director for the FADA and for the South Florida Auto Dealers Association, SFADA. In fact, I even served on the executive committee of the FADA. This is when I became aware of how much money and influence we car dealers had through our associations. 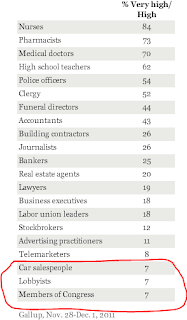 Car dealer associations contribute huge sums of money to candidates of both parties. They don’t care which side of the aisle he’s on or what political philosophy a candidate has; they care only if that candidate will “play ball” when it comes to not voting for regulating car dealers. The power of the car dealer lobby was fully understood by me four years ago when I attempted to get a bill through the Florida legislature to outlaw the dealer fee. I flew to Tallahassee and testified before the state senate commerce committee. The FADA testified at that same hearing defending the dealer fee. The bill never even got out of the committee much less get a house sponsor. When I returned home and spoke “off the record” with some local state legislators, I was told why I didn’t “have a snowball’s chance” of getting the dealer fee made illegal in Florida. The legislators I spoke to agreed with me that the dealer fee was a bad thing for the consumer but they also said it would be politically impossible for them to publically take that position. Offending the powerful car dealer lobbyists would jeopardize their reelection. An analogous situation is playing out now with respect to gun control. The national news recently reported several terrible incidents of mass killing by deranged killers who legally obtained their guns. You would think that some politicians would have rushed to introduce more gun control regulation or better enforcement of the current regulation. Have you noticed that democrats, republicans, and independents have done or said nothing? The reason is the National Rifle Association, NRA, the most powerful lobbying association anywhere. I wish I had an answer to this dilemma. Our political system leaves a lot to be desired but it’s still the best on the planet. It hasn’t really changed that much over the years. Politicians’ #1 and #2 priorities have always been to get elected and reelected. Our founding fathers foresaw this problem and that’s why they provided for freedom of the press in the First Amendment. The news media is often referred to as the “Fourth Estate”, meaning the fourth branch of our government next to the Executive, Legislative, and Judicial. The news media’s job is to keep the other three branches, especially the legislative, honest. Our founding fathers might not have foreseen what impact the greatest recession in our history might have on the news media. Survival is a primal instinct and it can trump ideals like courage and integrity. If a journalist loses his job today, he might have a very hard time finding another. The watchdogs that our founding fathers created to keep our politicians honest are too afraid to growl for fear the VP of advertising might not like it.